Computing and Technology Services (CTS) would like to advise users of a marketing tactic utilized by some companies to represent themselves as an associate or affiliate of university services. 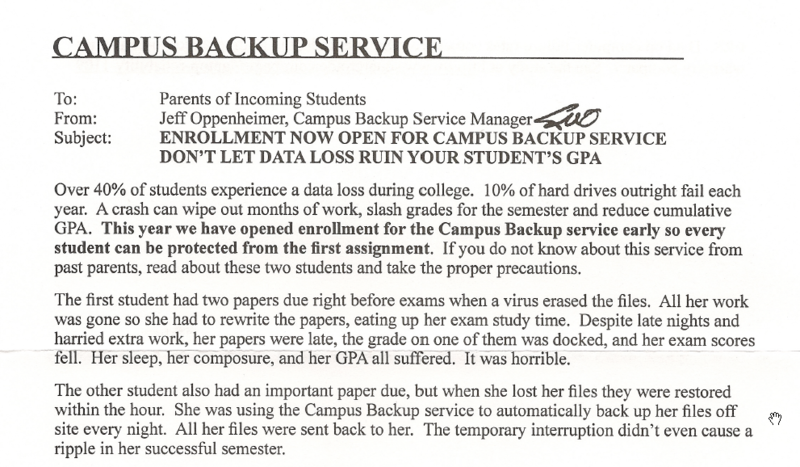 Companies like Campus Backup Service (see below) are not affiliated with Duquesne Univeristy or any other university. They compose their marketing outreach using language that might make you believe that they are sending on behalf of the university. Although these companies may offer legitimate services, it is always important to gauge the value of the service that is being offered. In many cases, a few minutes of research can end up saving a large amount of time, money, and frustration. How Should I Back Up My Information? CTS strongly encourages users to backup their information. However, instead of the option mentioned above, we recommend that students back up their data using an external hard drive or some cloud-based storage such as OneDrive, which is free through the Office 365 subscription that each member of the Duquesne community receives. If you ever have a question about an email offer or service, please contact the CTS Help Desk at 412.396.4357 and we can help verify the authenticity.